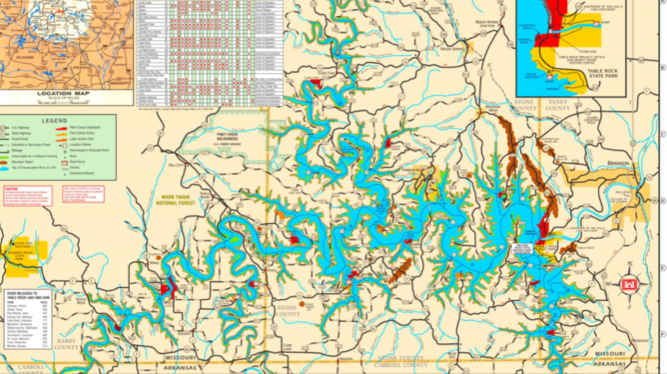 Located just a few miles from the Missouri resort town of Branson lies Table Rock Lake. 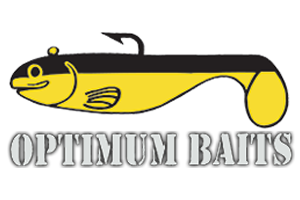 This 52,000 acre lake has all the bass species as well as most other popular fish. We arrived to be greeted by a massive cold front and 35 mph winds with gust up to 45 mph. After a quick look at the water we decided to be smart and stay on shore. 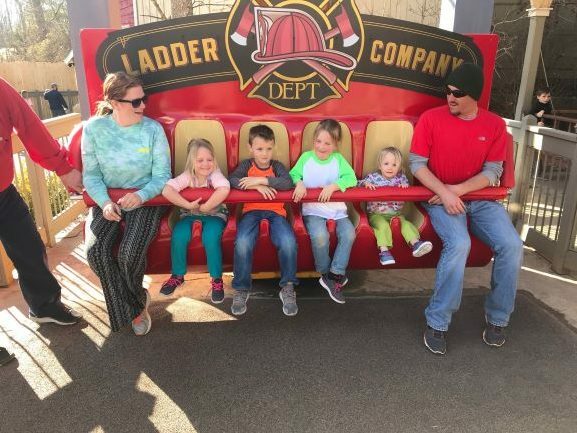 With fishing out for the day we took the families to the Silver Dollar City Amusement Park. 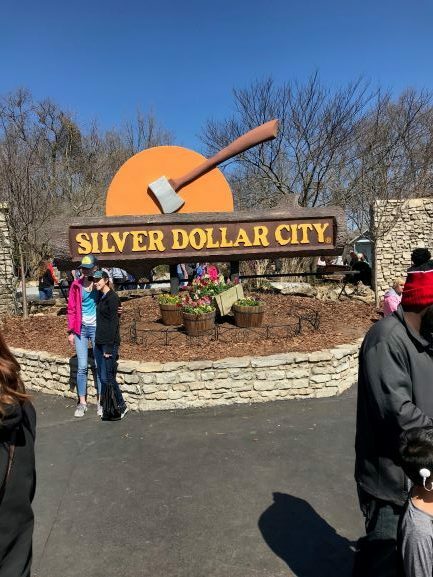 Just a few miles from where we were staying at Table Rock State Park, Silver Dollar City is an Old West themed Park featuring 7 high speed roller coasters along with dozens of other rides for kids and adults of all ages. 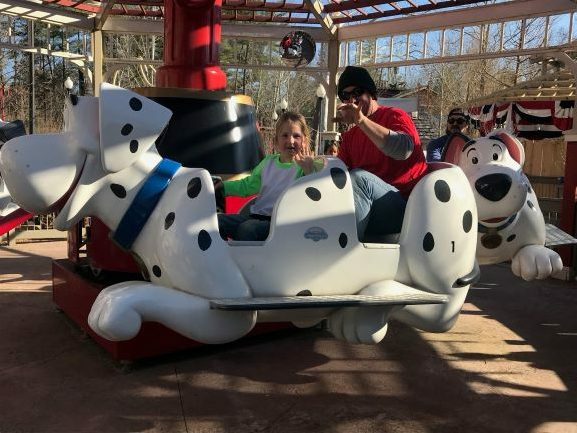 They feature Old West style entertainment and lifestyle with a working blacksmith shop, Saloon Show, basket weavers and Narrow Gauge Steam Train that circles the park. It had enough variety to keep visitors both young an old entertained for a few days. 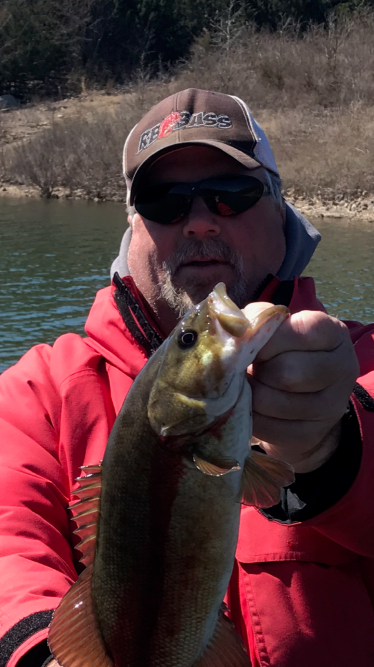 The winds died down enough the next day that we were able to get out on the lake for a little Bassin. We found 42° water temperature and a bite that was tough to say the least. 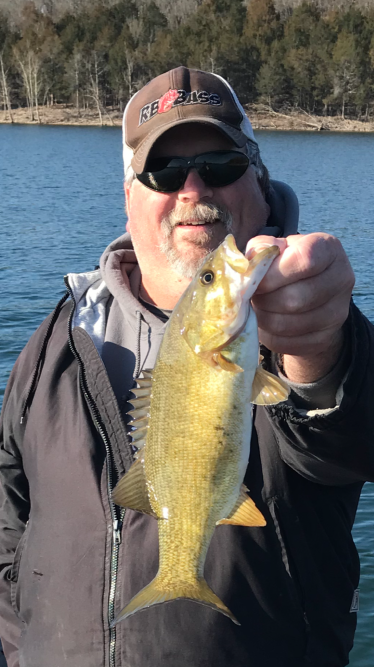 Hoping to find some fish coming out of their winter holding pattern we tried Slow ripping Jerk Baits along rocky points. Working from the lake side to the back of pockets we weren’t having much luck. 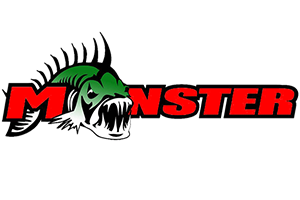 After making a brisk run to a new area we tried A-Rigs and crankbaits with one smallmouth to show for our efforts. Seeing some bird activity in deeper water we ventured out to see what interested the winged fisherman, what the graph showed was a nice school of Shad in 45 feet deep water. The Shad were on top of submerged trees that came up to 25 feet. With bass pushing them towards the surface, our fine feathered friends worked as our fish finder. 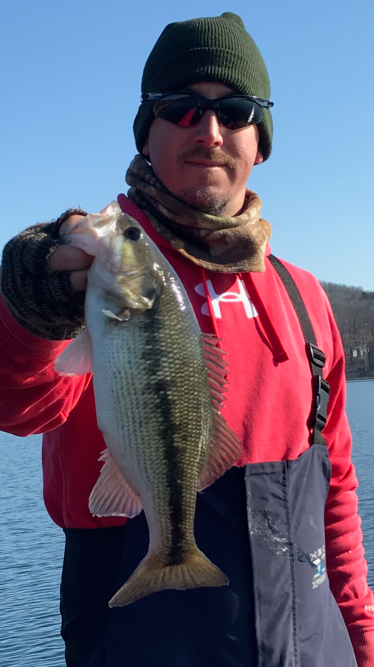 Dropping spoons down through the Shad school rewarded us with some bass. 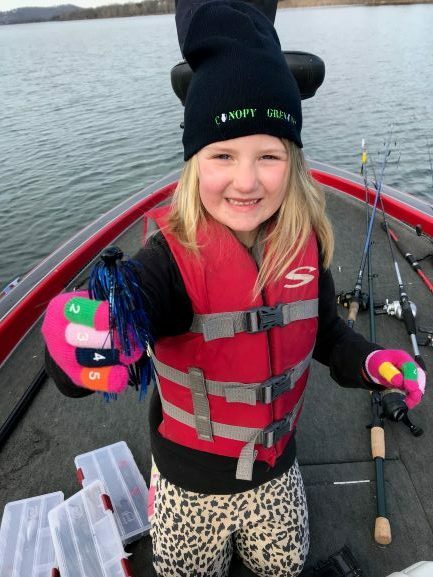 A massive cold front, an abundance of Shad and dropping water temperatures made the fishing tough, but watching the birds helped to salvage the day. 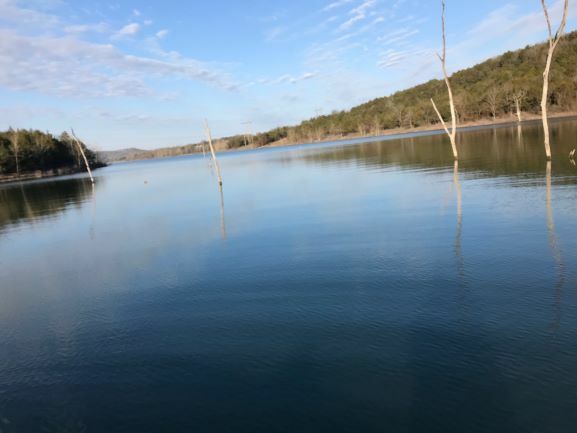 Table Rock Lake makes for an excellent vacation destination for the bass fisherman and his or her family, Table Rock State Park offers camping, a full service marina with electric on the docks, playgrounds for the kids and boat rentals. Silver Dollar City Amusement Park is nearby as well as the resort town of Branson. Branson hosts several music venues for Classic Country, Bluegrass and Oldies music. The Dolly Parton Stampede Dinner Show is another popular attraction. Not to far away is Springfield, Missouri and the national headquarters for Bass Pro Shops. There are several caves in the area and even a civil war battle ground.